This lamp is not a stand of glowing umbrellas nor a stand of peduncles. But since it’s inside and LEDs take care of producing the light, I have boldy invented a name for it: it’s a “LEDuncle stand lamp”. 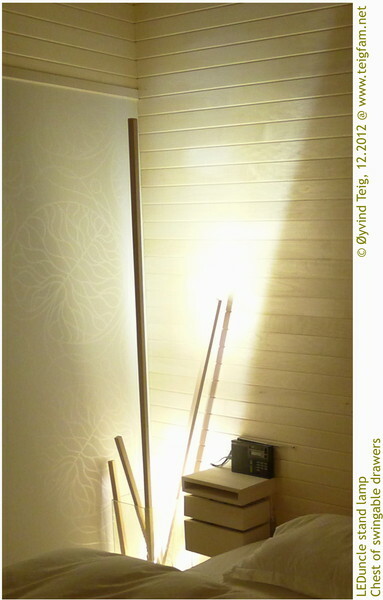 It consists of wooden lists with cut grooves containing LED lighting strips. LEDuncle has no hits in OneLook. There are three individual lamps in this lamp. A tall list, a medium list and two small lists. They are individually controlled, and may be individually moved around – including being hung on the wall – as well as being used as individual reading lamps, should there be a need for it. When we made this room, we wanted to use LED lights only. Incandescent light is out, and compact fluorescent lamps are too clumpy. So, LED is it! With those design specifications and LED’s flexibility, I just couldn’t wait! As mentioned the lists may be positioned anywhere. However, lighting is based on indirect light, since it’s not nice to look at the LEDs. I could have added matt plastic or glass, but I did not do that. I still include that possibility as part of the design. Depending on the mood and the need of light, give the stack of lists a little push, and to bed! I have not seen such a lamp design before, neither in real life nor on the internet. Therefore: © Øyvind Teig, Trondheim, December 2012. Should anybody want to manufacture something like this, please contact me. If this design infringes on an already existing and published design, I am not aware of it. I take no economic interest in neither the product descriptions nor the Accolade chapter’s links. The lists are pine 21 x 21 mm. The groove is enough for the LED strips plus wires, some 13 mm deep and 9 mm wide. The wires are mostly hidden. Tiny brass nails across holds the LED strips. You can see the details in the slide show (press picture). No painting, so the lists will become light brown, which I like. The stand in this case is a glass container that I got hold of when they refurberished the Børstad transformer station at Hamar around 1975. I was 25 at the time. They had a whole room with lead acid batteries for back-up power for their high frequency telephone system that was installed in the early 1950’s. It was relayed over the power lines (AM modulated 60 kHz I think) to be used for communication withing the power grid of Norway. That system, with its glowing radio tubes, was one of the reasons that I became an electro engineer. On the other side of the bed is another glass container of a different size. It may be used as a stand for a list later on. I bought two LED strip sets from IKEA (DIODER LED 4-D). Each set have 4 LED strips of length 25 cm, and an electronic transformer that’s a fixed plug-in, so the on/off switch is in the 12 Volt cable to a connector box. All 4 strips together draw 2 W, so there should be 500 mW per strip. The LEDs have a warm white (2700 Kelvin) light colour. I soldered two 220 Ohm resistors in series into each switch, giving 10 mA current to all four LED lighting strips for ambient light. (Sum 440 Ohm 500 mW. Wattage is no problem also during a short: total 330 mW. However a short is almost impossible in ths strips as probably three LEDs are in series with a single serial resistor). One set of four strips was mounted in the medium wooden list, and the other set had two strips in each of the shortest list. 2 Watt per strip set (=list) yields max 6 W in total (including some loss in serial resistors). (See note 117 for a discussion of serial resistors and possible shorts). 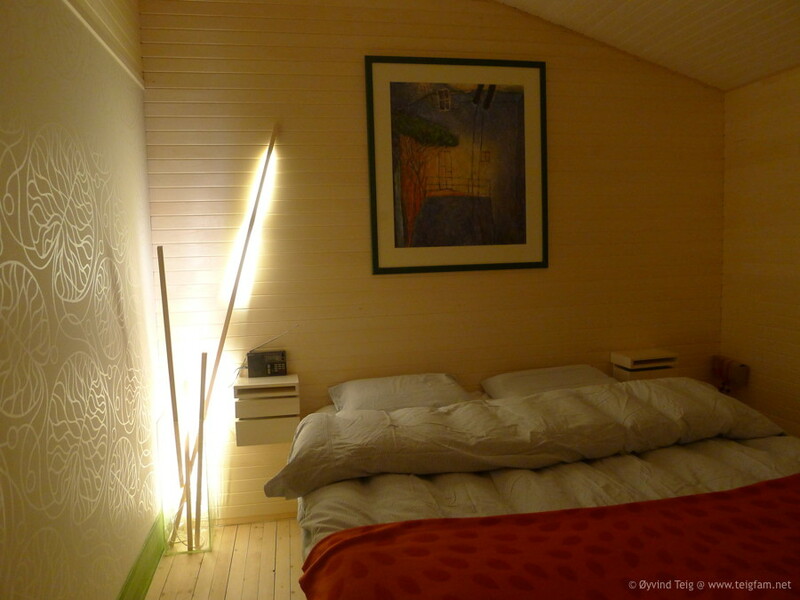 The longest list has somewhat more light, produced by a LED strip set from North Light consisting of four strips, from Clas Ohlson (a Scandinavian local). It has 3200 Kelvin light colour, so it’s a little whiter. 24 LEDs per strip, drawing 2 Watt @ 12V per strip. This of course includes the loss in the internal resistors on the strip, as with the IKEA above. The switch is in the 230 Volt AC cable from the plug, so I don’t have an ambient mode on this list. Now I have 8 W total. There is a switch by each bed, and the switch by the door powers a relay that switches all lists on: the longest to full and the two others to full or ambient, dependent on the position. So the wall switch then gives about 15 W LED in total (again, including loss in serial resistors). This is very shiny. I used the wires that came with the sets, but soldered instead of using the connectors. And do I have a pile of wires left? Observe that flexible LED strips are also available. ELFA would have some, like LEDlight flex of brand Barthelme. And there’s no reason not to make curved or partly curved wooden lists! Maybe even twisted! By the way, some years after this I made some lamps inspired by these lamps; see my note 121. The picture on the wall is a to scale photo of an original oil painting on canvas, 70 x 80 cm by Aldo Ezio Conelli called Occhi della Sera (Eyes of the Night) on cotton paper. Photography of the original and inkjet printing by Duccio Nacci in San Gimignano. Search words in Norwegian: LED-list LEDlist LED belysning lampe lagd av trelister som kan stå i glasstank. Børstad transformatorstasjon.